A stirring new series based on the Gospel of John with Jean Vanier. Jean Vanier is a world-renowned spiritual leader. His over 100 L'Arche communities around the world have provided a vivid demonstration of the beauty, dignity and humanity of severely disabled persons. He reveals the heartbeat that pulsates through the Gospel of John in a way that will arrest your attention and open up spiritual windows to priceless views for those who care to gaze and consider. 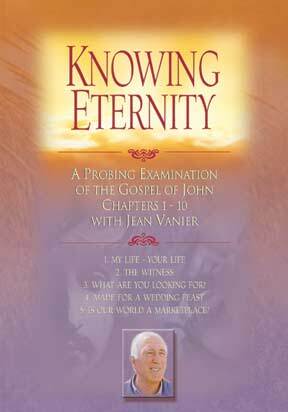 From his lifetime of ministering to difficult human needs, Vanier pours forth his insightful reflections on the first 10 chapters of John’s Gospel in this 13-part series: Knowing Eternity. The Word Became Flesh - Chapter 1: In this opening episode, Vanier discusses the relevance of John's Gospel, with its emphasis not on the historical Jesus, but on the contemporary Jesus – one whose words and deeds introduce us to a new reality. John the Baptist - Chapter 1: Jesus lived and preached in Israel. While many there loved and welcomed him, others saw him as a danger. In this episode, Vanier explores the gospel's roots in Jewish spiritual tradition. The First Disciples - Chapter 1: In John's gospel, Jesus greets his first disciples with the words, "What are you looking for?" As Vanier explains the Jewish people were awaiting a prophet to liberate them, but Jesus was not the kind of Messiah anyone was looking for. The Miracle at Cana - Chapter 2: In this episode, Vanier explains the powerful symbolism of his first miracle, changing water into wine, which showed the disciples "that our final destiny is to live with God and with others in an immense celebration of oneness." 5. IS OUR WORLD A MARKETPLACE? The Temple Cleared - Chapter 2: In Jerusalem, Jesus drove the moneychangers from the temple. As Vanier explains in this episode, these dramatic actions were a rebuke against our tendency to focus on the material concerns at the expense of the sacred and the holy.